This project will identify improvements that would "complete the street" for pedestrians, cyclists and transit-users in this key segment of Central Ave. between Downtown and Nob Hill. This project will identify key improvements for Central Avenue between 1st and Girard. March 2014: The Planning Team has put together an updated Draft Plan for public review. 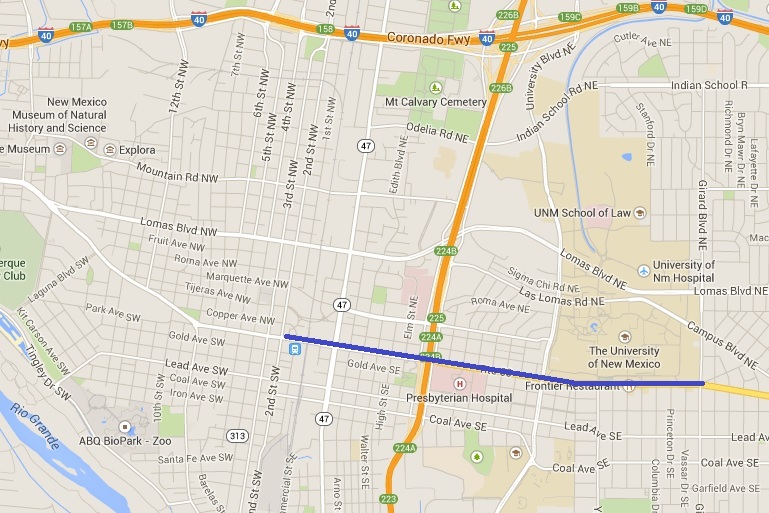 This Project focuses on Central Avenue between 1st Street in Downtown Albuquerque and Girard Boulevard in Nob Hill. View a map of the project. This project will identify improvements that would "complete the street" for pedestrians, cyclists and transit-users in this key segment of Central Avenue between Downtown and Nob Hill. The City Council office has retained nationally-recognized firms Gateway Planning Group and Nelson\Nygaard to help develop a "Complete Street" plan for Central Ave. from 1st Street, near Downtown, to Girard Blvd., near the University of New Mexico campus. Central Avenue (historic Route 66) is Albuquerque’s "Main Street," traversing the city from east to west, from City limit to City limit. It varies in character and function as it travels through many of the city’s oldest and most distinct neighborhoods. In the stretch of corridor heading eastward out of Downtown Albuquerque and through the university area (University of New Mexico), Central Avenue is in need of a transformation from an auto-oriented, auto-dominated roadway into one that better serves the many urban dwellers, pedestrians, transit users, students, and other non-motorists who have chosen to reside and conduct their daily activities along and near the Central Avenue corridor. Area residents and business owners have expressed concerns about pedestrian safety (e.g., the lack of adequate pedestrian crossings), excessive travel speeds, the design of transit facilities (i.e., bus pull-outs vs. in-lane loading), and other aspects of the existing design of the public realm that are perceived to be impeding redevelopment efforts. The purpose of this planning effort is to identify improvements that can be made to the Central Avenue corridor to increase safety and efficiency for all users, create a more pedestrian-friendly environment, and leverage key investments, such as the enhanced Bus Rapid Transit (BRT) service that is being studied by ABQ Ride in a separate effort. Ultimately, this project will result in an implementable "Complete Street Master Plan" that will help acheive this transformation. The March 2014 Draft Plan reflects comments and concerns raised by stakeholders during and after the October 2013 presentation of the first draft of this Plan. Please review and provide any comments via the contact information at the top of this page. and implementation of on-street bicycle facilities. View or download the March 2014 Draft Central Avenue Complete Street Plan and Design Toolkit. The Project Team will consider comments from stakeholders and produce a final draft version of this plan in the coming months. Moving forward, we will continue to coordinate with ABQ Ride regarding street configurations as they continue their development of a Bus Rapid Transit (BRT) system. ABQ Ride recently received approval from the Federal Transit Administration to move forward with design of a Central Ave. BRT, which is expected to begin in the next year. Because of its importance to the economic health of communities along the corridor councilor Benton is committed working with stakeholders on implementation of some improvements, where feasible, prior to BRT. educate stakeholders on the purpose of this project and the concept of "Complete Streets"
Gateway Planning is a Fort Worth, Texas-based town planning firm that specializes in urban design, form-based code, public-private finance and community facilitation. Nelson\Nygaard Consulting Associates, Inc., headquartered in San Francisco, Calif. is a transportation planning firm focused on multi-modal transit, transit-oriented development and mobility improvement.